inMOTION Auto Care has Uniroyal® tires for sale in Lincoln, NE. Uniroyal® has a rich history in tires that dates back to 1892. Trusted for years, Uniroyal® takes pride in manufacturing dependable and affordable tires to many Americans. Their mascot, “The Tire Tiger,” is well loved and has been a symbol throughout the years. He is the symbol that reminds them of tradition, perseverance, and pride and that is a part of the Uniroyal® tire brand. That is why they put in the effort and go the extra mile towards producing durable and dependable tires for cars, SUV’s, minivans, and trucks. 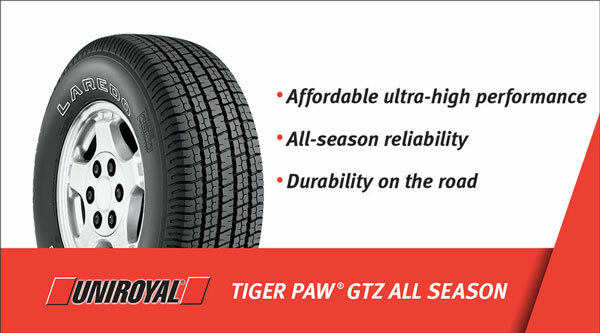 Uniroyal® has two major lines of tires, The Laredo™ and Tiger Paw™. The Laredo™ is for SUV’s and pickups; the Tiger Paw™ line is for cars and minivans. Commercial tires are also available upon request. 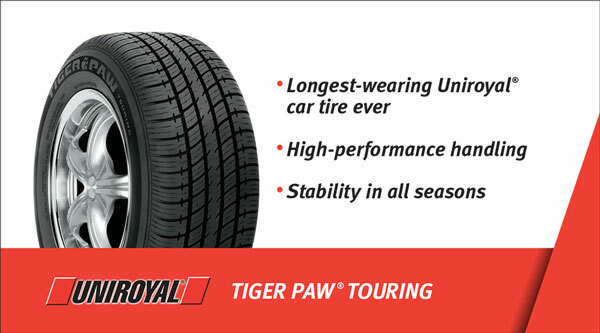 inMOTION Auto Care in Lincoln, NE offers proudly offers Uniroyal® tires for sale. We also provide complete tire repair and maintenance to ensure you get every mile out of your tire possible. We recommend buying tires in sets or pairs to avoid uneven wear. Additionally, we advise that you check your tire pressure monthly and rotate them every 5,000 miles. Check out our specials page for valuable savings on your next visit. Call, stop by or schedule appointment online today. Our Tire Specialists will be happy to help you find the perfect tire for what you need.